Buying a mattress online: Yes, you can totally buy a great bed on Amazon! We closed on the weekend place – yay! We need a bed there – now! Unfortunately, buying a mattress the old fashioned way is – how to put this nicely? – not fun. The store is far, price doesn’t really correlate with comfort, mattresses are expensive, salespeople generally rub me the wrong way, and I hate waiting on a delivery window… especially in a new home that is otherwise empty. I had this crazy idea: could I just buy a bed on Amazon, get it delivered to my city apartment, stuff it into my car, and haul it over to my house on my own time? There are several companies competing for your online mattress moolah these days. The key players right now are Tuft and Needle and Casper, but they were a bit spendier than I had hoped to go for this weekend getaway home, and reviews on both seem to think they’re firm and I’m not a firm mattress person. So I looked at cheaper offerings – and I mean a lot cheaper – and settled on the well-reviewed Signature Sleep Contour. For $250 I was expecting something a half step above a cardboard box from IKEA bookshelf but the reviews were so good I couldn’t resist. Also, shipping was free (thanks, Prime) and returning within 30 days would be free (plus none of that store credit instead of refund that you find at most mattress stores). I rolled the dice and ordered it. 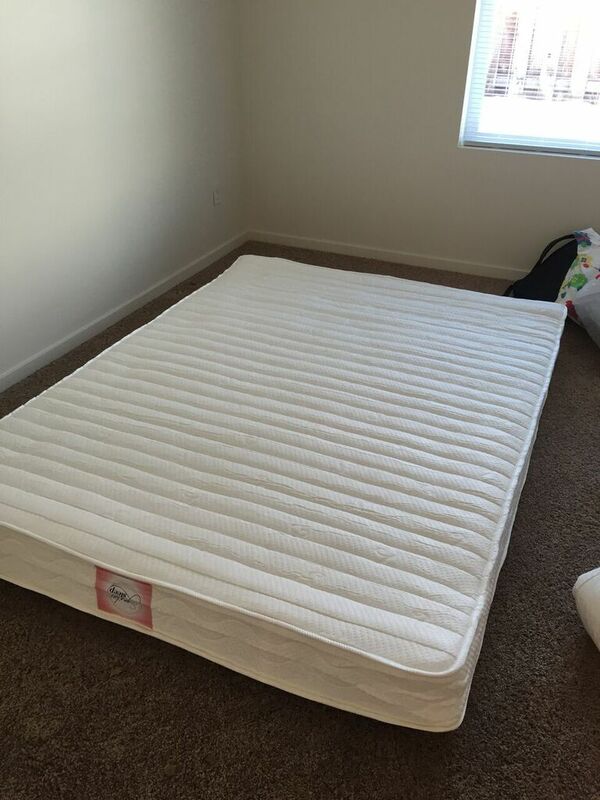 Manufacturer’s photo showing the Signature Sleep mattress in all its glory. The mattress is reversible (top and bottom are indistinguishable). Getting the mattress out of its cardboard sarcophagus was the most difficult part of its setup. The cardboard box it ships in is thick and tough as nails, and we had limited cutting tools at the new place. We managed to saw it open eventually. Once out of the box, it’s just a vacuum packed mattress inside a huge plastic bag, rolled up into a tight cylinder. Roll it out flat, cut the bag, and fwooosh – it fills up and takes its final form in a few seconds. My new mattress, sans plastic vacuum wrapper. Firmness is super subjective, so take my analysis with a grain of salt. I would call this a firm-ish mattress. I’ve certainly slept on firmer. If firm-to-soft were a horizontal spectrum, this one would be be slightly to the left of the middle. If you’re worried about it being too firm (as I was, I prefer a soft mattress), you can (and should) add a plush mattress pillow-top pad to give it some more squish. It makes a huge difference. My waist is narrower than my hips and shoulders, so I tend to prefer a softer bed for complete support. I think its odorless and I’m usually the first to notice a smell, no matter how subtle. 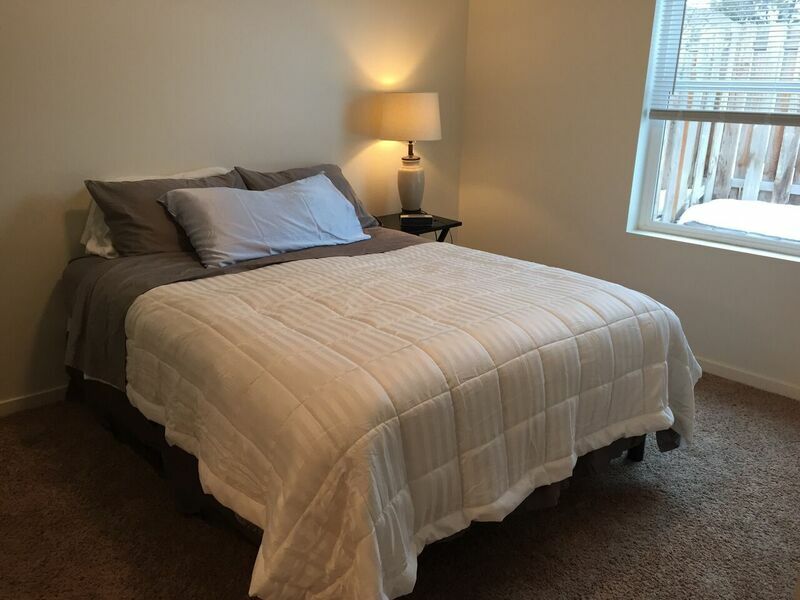 If it has an odor, it was quickly stifled by the mattress pad, protector, and sheets I wrapped the bed in. I haven’t observed any of my usual “sharing a bed” gripes with this mattress when laying on it with another person. No rolling towards the middle and I couldn’t feel normal nighttime movements from the other person. I’m super picky about what I sleep on. I don’t do air mattresses, sofas, floors, cots, roll out beds, most hotel beds feel like thin crap to me, etc. All previous mattresses I’ve purchased came into my life via a trip to the mattress store. That’s just How It Was Done In Those Days and I thought if I was going to spend 8+ hours a day on the thing, I ought to lay on it for ten minutes first. That’s why buying a mattress online was the thing I struggled with the most in this whole buy-my-bed-online adventure. Interestingly, Sleep Like the Dead found that online mattress shoppers actually experience less dissatisfaction with their online mattress purchase than in-store mattress shoppers do. Ultimately, the ability to return the mattress is what won me over. Also the fact the house needs a guest bed someday, too, so this one could get demoted if it didn’t work out. So far, though, I am quite happy with my Signature Sleep mattress. Like, I’m actually excited to go back to my weekend house so I can sleep on it again! You can return the mattress if you don’t like it. In its shipping box, the mattress is much easier to transport than a typical mattress (until you unbox it, then it becomes normal mattress sized and doesn’t roll or flatten again). I slept great on it! The mattress in its box weighs about 80 pounds. You may need a helper to get it into a car, and it’s pretty long so it’s not going to fit into your ordinary sedan. I was able to haul mine in a 2013 Subaru Forester with the back seats laid flat. 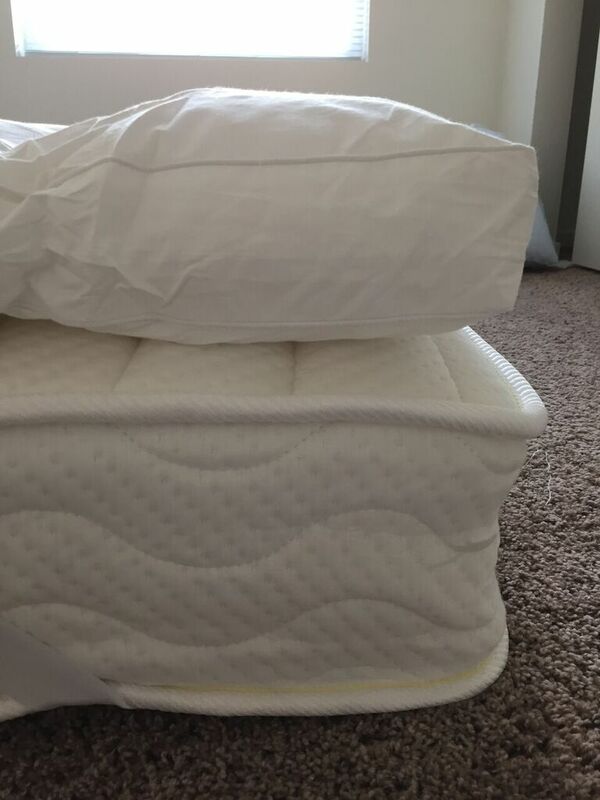 There’s a thick braided cord around the border of the mattress, which I don’t notice because of my 3″ thick Lucid brand plush mattress topper (see further down in this article for a review), but you might notice it if you don’t add a topper. To make my bed softer and cuddlier, I added a ~$99 Lucid 3″ high bed topper. I now own two of these wonders: the first one is at my apartment. These toppers are super plush, survive the washing machine intact, and don’t seem to lose much height or plushiness over time. Lucid mattress topper: look how plush this thing is! It gets squished down with the sheets and mattress protector on but the softness holds up. I bought mine in person at my local Fred Meyer (big box store here in the Pacific Northwest) a while ago: a couple of Coleman brand standard size pillows (which I can’t find online for the life of me). I like fat, heavy pillows. My boyfriend loves his Coop Home Goods memory foam pillow. I am not a fan of memory foam for sleeping. It feels too gooshy and smells a little funny for the first few weeks, but it’s a different-feeling blend of firmness and squishiness that might be right for you if you dislike the feel of common store-bought pillows. I do like this pillow for sitting up in bed, though. The Coop home goods memory foam pillow is moldable and supportive. 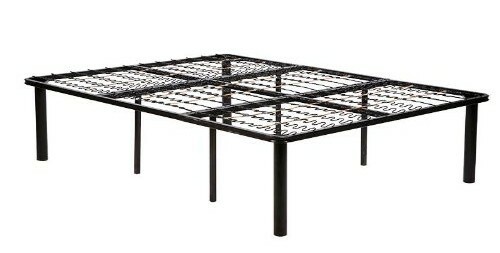 For the bed frame (“box spring” included), I snagged another Handy Living queen size bed frame & box spring from Amazon. 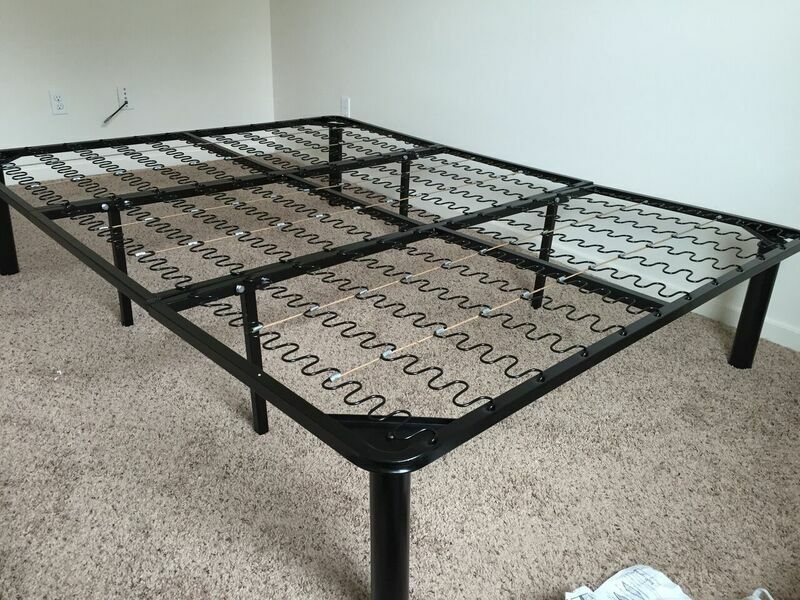 Handy Living queen size bedframe is a box spring and bed frame in one. The storage underneath this thing is crazy, especially if you’re used to not being able to put much under your traditional bed frame. Apparently box springs aren’t necessary anymore, which was news to me when I bought my first copy of this bed frame in October 2015. I was skeptical of the whole “no box spring” thing but I was quickly won over by the built-in springs and the cavernous amounts of under-bed storage this thing offers. I have this same frame under my apartment’s mattress (a mattress that originally came with a box spring) and I can’t tell the difference. Chuck the box spring and get one of these! It’s heavy when it’s still in its box, but easy to assemble: about 20-30 minutes and you’ll definitely want two people and a rubber mallet. It is easy to slide around on the floor for positioning once built. After 4 months of daily use (for a variety of activities, not all of which are sleeping), I have yet to hear a squeak out of it. It doesn’t wobble and the bed doesn’t slide off of it after I hooked the mattress cover over the corners of the bed frame. It doesn’t have those painful little feet that stick out for your toes to jam against as you make the bed. Ordinary length bed skirts fit perfectly so no one has to see all the junk you stuffed under the bed. Tons of storage underneath your bed! None really, it’s fantastic. I’ve never had to take it apart, though, so there could be some surprises there. I kept this one simple and grabbed Amazon’s best selling mattress protector, the SafeRest Premium Hypoallergenic waterproof mattress protector. Wrap it up in a mattress protector and keep out fluids, mites, dust, and bacteria. It fit great and looks great – and for ~$30, it’s perfect. I fitted my bed with a new set of Fieldcrest sheets from Target. I’ve been in love with Fieldcrest for over a decade and I like touching the sheets in the store before I buy them. If I had to buy my sheets online, I would go over to Target.com and buy either the damask set or one of their higher thread count sheets, or I’d get this highly rated ~$70 650 thread count Egyptian cotton blend sheet set on Amazon. Be careful buying sheets on Amazon, though: a lot of their sheet inventory seems to be misleadingly marked with numbers implying thread count or words implying fabric blends that aren’t true to the product. I wouldn’t pay $25 for a set of queen sheets and expect good quality – the $60-$90 price range has treated me well. This is hands-down the way to buy a mattress and put a bed together. I’m super happy with my bed from the Internet and I’m glad I skipped all the mattress store hassles.